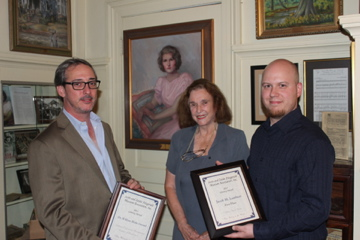 winner of the 2013 F. Scott and Zelda Fitzgerald Museum Literary Contest. Lambert is an English major at Auburn University Montgomery. Photo by Tim Hettler/Massachusetts Office of Travel and Tourism. Editor’s note: “A Man by the Pond” won first place in the college division of the 2013 F. Scott and Zelda Fitzgerald Museum Literary Contest. Jacob Lambert, the author, is an English major at Auburn University Montgomery. The short story is set at Walden Pond in Massachusetts, the real inspiration of Henry David Thoreau’s classic work Walden from the 1840’s. Thoreau’s work influenced the modern environmentalist movement and also included some wonderful humor and fresh perspectives on the traditional world and ways of thinking. 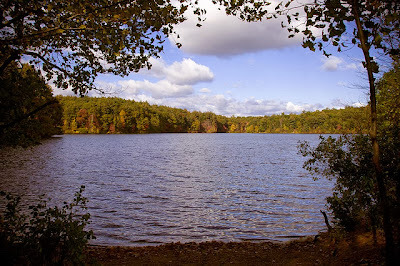 After the story, please click on the links in the Tourism Guide to learn how to visit the real Walden Pond today. Please also learn about the sponsor of the contest, the F. Scott and Zelda Fitzgerald Museum in Montgomery. Photos: Click photos to enlarge! 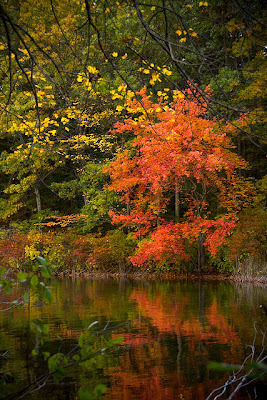 The photos of Walden Pond in this article came from the Massachusetts Office of Travel and Tourism’s Flickr page, used under the Creative Commons license. Many more pictures of the area are available by clicking here. As the train came to a shuddering halt, Thomas Little stepped down the steel steps and out into the dry summer air. In the distance, he could see an immense pond, one surrounded by a forest that seemed to threaten the very integrity of the above crystalline sky. The humidity, along with the multitudes of insects swarming around his sweaty, waxen face, made him wish that he had worn something thinner, less heavy, than his current black slacks and grey wool jacket. However, that was the dress for the day, or what the gentlemen at Harvard suggested, but Thomas, now walking around to the other side of the train, his eyes resting beyond, towards the pond, was growing tired of these formalities, these outfits of gloom. Perhaps, the man he was going to see, the one who would lecture next week—depending, of course, on the merits of their conversation—might make his job simpler, giving a concrete “yes,” without his typical allusions to abstract philosophies. Then, hopefully, Thomas could go home and change, see his family, and, possibly, read—but he doubted it. After all, he was going to see Henry David Thoreau. The walk was a laborious one: tall grass, dried mud, and more insects, each making the journey to the minuscule cabin in the distance tedious, almost painful, but Thomas continued, his stale brown eyes scanning the ‘property’ for the man in question. Then, approaching the wooden refuge, there he was, sitting to the right of the cabin, his attention engaged to a small book in his lap. “Mr. Thoreau?” Thomas asked, confused as to why the man resigned himself to reading in the dirt when, just inside his tiny home, there was a perfectly apt desk for the task. For a moment, Thoreau continued to read, as if he had heard nothing, but seconds later, he abruptly slammed the book to a close and turned to view the heavy man to his right. He then stood, stretched, and nodded—saying nothing in reply. The first thing Thomas noticed was the grimy clothes the man wore: tattered, dusty slacks and an equally ramshackle black jacket. His black beard, seeming to cover only his jawline and under, was unkempt, and his hair, aside from growing wild on his head, looked as if he had been sleeping in the woods. But his eyes, deep-set and masculine, emanated intelligence, a sort of searing blue seen only in the hottest part of a flame. An outdoor guidepost at Walden Pond. “You are Mr. Thoreau, are you not? Thomas asked. “I don’t quite understand you, sir. What life can a man profit from this place? There is nothing but sediment and emptiness,” Thomas replied, bewildered by Thoreau’s statement. At this, Thoreau’s smile widened, his eyes seeming to drill through Thomas’ own. In that smile, Thomas could see another, less appealing characteristic of the man: his unconventional face, the ugliness that surely plagued the tall man, another possible—if not frank—reason for his departure from society: hiding, not basking, in the wilderness of the forest. “Life! who knows what it is—what it does? If I am not quite here I am less wrong than before,” Thoreau replied, taking a step to the right and walking past Thomas, towards the pond. It was, Thomas thought, like speaking to someone foreign, someone lacking the ability to translate mind to mouth, like a child searching for understanding in grunts and cries. Thoreau was exactly like what he expected, especially after the briefing at the university, where warnings about the man’s strange sensibilities remained hidden in conversation. Only a few more inquires, Thomas thought, and then down to business. 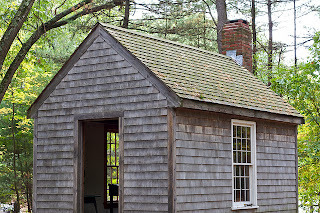 The replica of Thoreau’s cabin at Walden Pond. “So you say that it is too dry? Or lacking the vitality of truth? What do you mean?” Thomas asked, but Thoreau had stood up and started to walk towards his cabin, intent on finishing the conversation with the closing of a door. Before there was a reply, Thoreau was out of sight, leaving Thomas to venture back to the train, back to Concord, and though the heavy-set man thought of pursuing Thoreau, trying one more time for the answer, he figured he would just wait, leave the task to someone else more suited to it. The university, after all, did have other representatives, and Thomas, already exhausted, decided to leave the man alone, leave him to his dirt and trees. “Perhaps, sending a letter would suffice. Surely the man has a mailbox,” Thomas said, turning around, a smile forming on his thick lips. Posthumous Assessments, Criticism. 3rd ed. New York: W. W. Norton Co Inc, 2008. Print. member Martha Cassells (center) at a museum reception. Photo from F. Scott and Zelda Fitzgerald Museum. 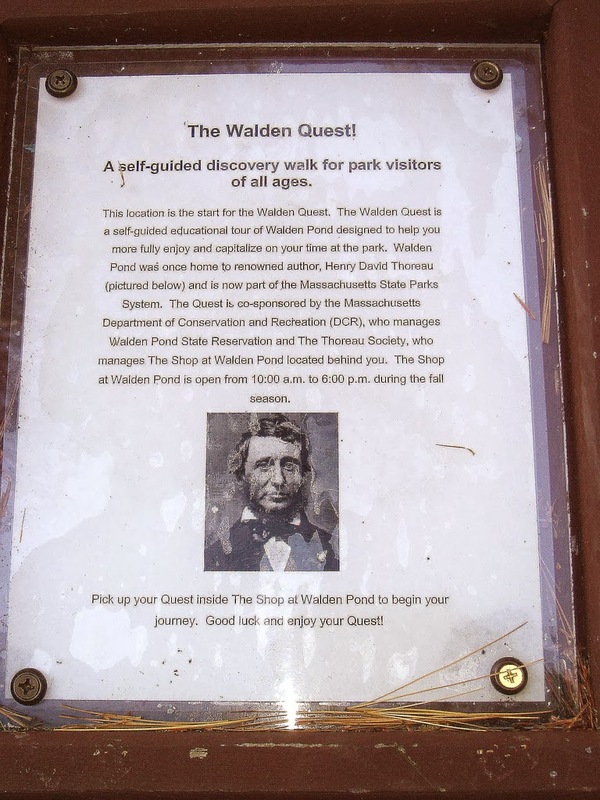 Fortunately for modern literary tourists, the real Walden Pond has been preserved as a state reservation and is still accessible today in a condition almost as pristine as Thoreau knew it in the 1840’s. Any student who has ever had to write a paper or essay on Thoreau might appreciate the humor in this story, but it also reintroduces Thoreau to modern readers. After reading this story, I immediately pulled out my Kindle Fire and downloaded a copy of the classic Walden and started reading it again. I found myself laughing at Thoreau’s humor and found some new resonance with his writing that I didn’t seem to have when I was younger. 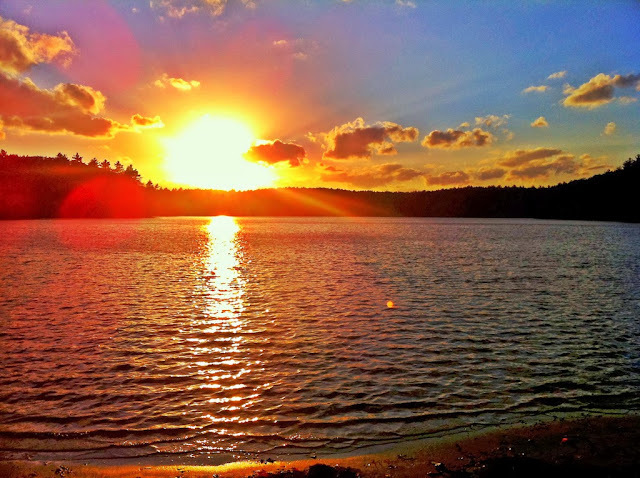 If you click on the tourism links below, you can learn more about how to visit Walden Pond. If only such links were also available in the book Walden itself, then perhaps generations of current and future readers might be introduced to a unique and inspiring literary tourism attraction outdoors. If every new person who read Walden in the future were to be offered links inside the book inviting them to Walden Pond, that could have a strong economic impact on the state of Massachusetts over generations, considering that Walden is a classic work that will be read by millions of students over time. The real Walden Pond offers swimming, canoeing, and hiking, so stop by and soak up the beauty of nature perhaps while soaking up some classic literature as well. If you would like to learn more about the sponsor of the literary contest, please also click on the links to the F. Scott and Zelda Fitzgerald Museum below. The Fitzgerald museum holds events throughout the year such as 1920’s Flapper galas, book signings from New York Times bestselling authors, poetry and writing contests, and art and movie exhibitions, to name a few. Helping to judge the literary contest has been one of my favorite aspects of working with the museum. We do have our own tourism edition of Fitzgerald’s classic 1920 debut novel: This Side of Paradise: Interactive Tourism Edition. Our tourism edition also has links to literary destinations related with Harper Lee’s To Kill A Mockingbird.